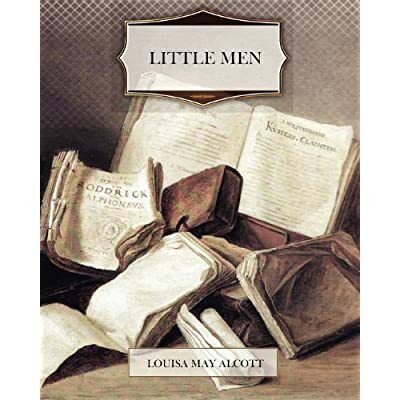 Little Men (Little, Brown, and Co., 1901) is the sequel to Louisa May Alcott’s beloved Little Women. In Little Men, the March girls are grown. Jo and her husband, Mr. Bhaer, run a boarding school for young boys. 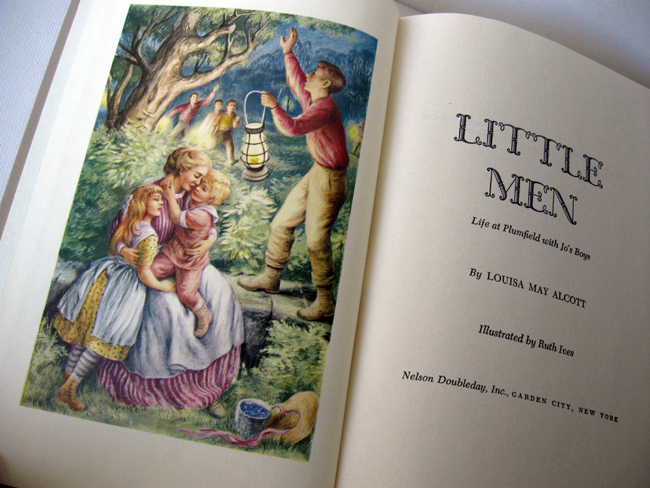 The book recounts the adventures, escapades, and lessons learned by the thirteen young boys and two little girls who inhabit Plumfield, the Bhaer’s home. The story begins when Nat, a young orphan, appears at the door of Plumfield, and the inhabitants of the house quickly embrace him. Readers see Jo’s home through Nat’s eyes as he experiences the loving but unusual traditions, rules, and ways of Plumfield. However, trouble begins to brew when Dan, an old friend of Nat’s, appears. Dan quickly endears himself to the inhabitants of Plumfield, and they show him unconditional love. Nevertheless, the bad habits and attitudes he acquired as a street orphan hinder his happiness. As Plumfield adjusts to its new inhabitants, the children learn important lessons about trust, faithfulness, unconditional love, and personal responsibility amidst daily happenings. Alcott’s colorful and realistic characters will delight children, and they will each find one to whom they can especially relate. Readers of Little Women will enjoy watching Jo, Meg, Amy, and Laurie begin to reap the rewards of their hard work and grand dreams. As Alcott’s characters live, work, play, and learn in the world of Plumfield, they teach and delightfully entertain readers. Each child deals with his own faults and successes. Nat tries to gain a reputation for honesty; Tommy learns to balance his curiosity and common sense.Nanstruggles for independence and learns hard lessons about personal responsibility, while Daisy begins to understand the rewards of persistence. Alcott treats some character traits with special emphasis. For instance, she consistently reinforces the value of honesty as the children learn repeatedly the importance of truth and the danger of lies. Even as Mr. and Mrs. Bhaer encourage creativity among the children, they continue to reinforce the importance of common sense and the value of obedience.Nanand Tommy learn these lessons the hard way, especially as their imaginations continually lead them and others into trouble. Teach your children to cook a basic meal, then let them try it on their own. Plant a family garden and encourage each child to choose and take charge of a particular crop. Sing or play instruments together as a family. Create an insect collection by gathering, labeling, and preserving insects, just as Dan did. Who sent Nat to Plumfield? Why did Mrs. Bhaer purchase the kitchen for Daisy? How did the fire in the nursery begin? According to Mrs. Bhaer, why did the first tea party go badly, and why did the second tea party succeed?